Searching for a Reliable Home Appraisal in the Houston Meyerland Area? Our Texas certified real estate appraisers deliver residential and commercial appraisal services throughout the Meyerland area for both private use and lending usage. Our mission is to supply our clients with a quick, reliable and professional appraisal service that meets or exceeds their expectations and requirements for use. Not only do we turn around our reports faster than typical appraisal businesses, we offer some of the most attractive fees for appraisal services in the market. We only employ appraisers that are local to the Houston area and are experienced with its varying markets. Our staff is capable of taking on assignments for residential, commercial or mixed-use properties. For commercial jobs we only employ Texas Certified General appraisers with a minimum of 10 years of experience in the Houston market. Whether you need a home valuation report for financial, private use or a legal issues, our appraisal services can accommodate almost any real estate valuation needs. Be it homeowners or industry pros, our promise to you remains the same – to offer a reliable and courteous appraisal service. If you have questions, or do not see the precise service you need, you can use our website contact form or phone us directly at the number displayed on this website. Getting in touch takes minutes! 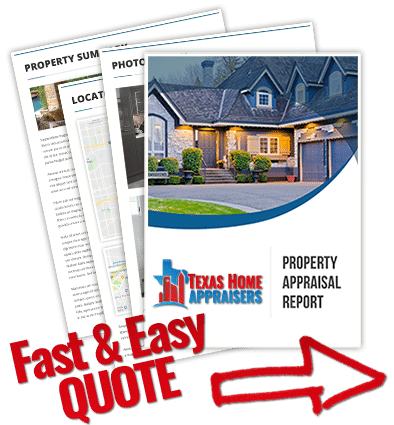 Simply submit the web quote request form or dial our direct line and one of our public houston property appraiser will be more than willing to discuss your appraisal. The appraisal is a research intensive process whereby an appraiser reviews general and specific data, extracts relevant information, and uses this in his/her analysis to determine an estimate of value. The process has six major steps which include: definition of the problem, preliminary survey and appraisal plan, data collection and analysis, application of the three approaches to value, reconciliations of value indications, final estimate of defined value. Common to most all appraisals is the determination of applicable approaches to value which include Market Data, Cost and Income. All approaches which are utilized are reconciled and deduced down to a single estimate of value which represents the most likely value for the property. In most instances, the market data approach is the best representation of buyer and seller influences in the market and relied upon heavily in residential appraisals. Every appraisal will include an effective date which indicates the day the estimated value was determined to be valid. The speed at which changes in home values occur in your market area determines how long an appraisal value is valid. Under most loan guidelines appraisals do not have a set expiration period; however, because lenders want comps that are no more than six months past, an appraisal should be no more than six months old. The typically accepted “expiration” period for an appraisal is 60 days. A comp can be a sale, pending sale or a listing that is similar to the subject based on typical parameters of size, age, condition and location. The appraisal value is heavily based on the sales comparison approach for most residential properties, making comp selection a very important aspect of the process. It is the appraiser’s responsibility to adequately research the local real estate market and determine which comparable sales best represent the value characteristics of the subject property. Do appraisers need attic access? Why are home appraisals so expensive?